Going to college is one of the biggest steps you'll take your entire life. You'll invest thousands of hours and tens of thousands of dollars. Before you go, doesn't it make sense to be as prepared as possible? College isn't like high school, and you'll have much more work to do. More to read. More to learn. More tests to take. Dr. Sandra Gibson is a study-skills professional who has taught thousands of college students how to succeed on today's competitive campuses. 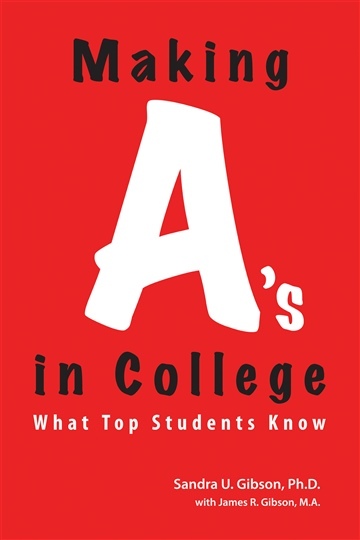 In Making A's in College, you'll find her top tips for all the skills you'll need to excel. Dr. Gibson, by the way, isn't just another freelance writer looking for a market--she's a full professor who has taught ONLY study skills in college. Her job is helping students do better. This book isn't a textbook, and it isn't a random collection of ideas suggested by students. Instead, it's an organized, easy-to-read, very useable approach to improving your study skills. Now we're pleased to offer this free NoiseTrade long excerpt from Making A's in College. We hope you'll enjoy it. Sandra Gibson is a study-skills professor who has worked with thousands of college students, helping them achieve on today's competitive campuses. As Director of Georgia State University's Learning Assistance Center, she worked with individual students, taught seminars and classes, and consulted with corporations and governments. She knows what works from her experience on the firing line with students, and that's what is in her books. Real-world, readable, use-today strategies. Dr. Gibson has a Ph.D. in Reading, an M.A. in English and taught high-school English before becoming a full professor at Georgia State. She is married, and has two children. from Amazon reviews . . .
help me. This book helped me get a 4.0 gap during the summer. awareness of how you store and learn.